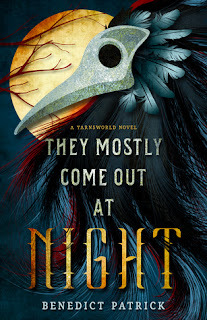 They Mostly Come Out At Night is wonderfully put together, with a consistent folk tale atmosphere that blends two cultures, histories, myths, and current scenes, with a coming of age journey. The setting is an old forest filled with dangers and secrets, and some disagreement about whether the dangers are mythical or real. The villagers haven't been in touch with the forest dwellers in at least a generation, and what used to be accepted knowledge has become rumor. The main character, Lonan, is a bit of an outcast. He doesn't really have a skill or a place in the village. When he starts having strange dreams, he wonders if they are leading him toward some new meaning in his life. What dangers lurk in the forest? Are the villagers doing enough to protect themselves? Do they even need protection anymore? The dreams end up connecting directly with Lonan's future, in an excellent way that I didn't see coming. Yarnsworld weaves a spell that entranced me completely. From the beginning of the story, I sank into this world. Chapters are divided with short folk tales of the culture that are referred to in other parts of the story. It's a charming way to fill out the oral history of the characters and develop the cultures better. I can't imagine how difficult it would be to create folk tales that sound old and well-established but are original to a fantasy world. This author makes it look easy. This short novel is a complicated piece that fits together very tightly and celebrates the value of oral histories, and the heroes and lessons they share. I highly recommend it for dark fantasy readers who enjoy folk tales, tribal customs, witches, tricksters, and intricate storytelling.